I'm a US citizen but my husband and I are currently living in the UK. We're preparing to file an I-130 Petition through the London Field Office. Can anyone who's done the same recently advise on what method of payment you used? The website says we can use a credit card but the credit card authorisation form only offers address fields for a card with a US billing address. Our cards have UK billing addresses so wondering if this isn't an option? I've also read on various sites that credit card payments aren't accepted at Field offices?! If not, is the only option to get one of my friends or relatives in the US to send us a USD money order or cashiers check? 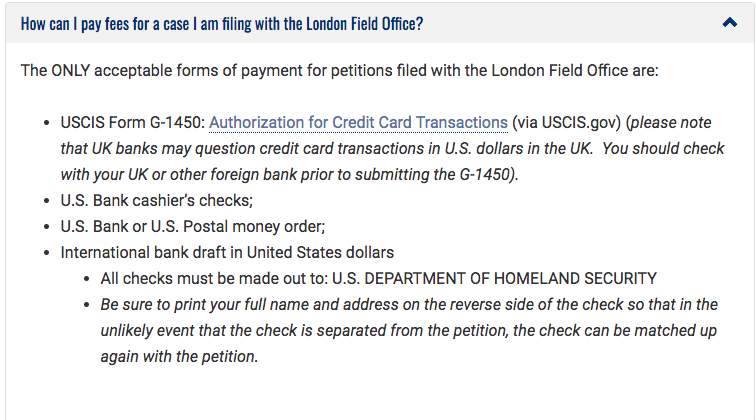 you must pay the fees to the U.S. Embassy cashier using a cashier's check, U.S. dollar money order, or an international bank draft made payable to the U.S. Department of Homeland Security. Our cards have UK billing addresses so wondering if this isn't an option?